Hans W. Paerl is Kenan Professor of Marine and Environmental Sciences, at the UNC-Chapel Hill Institute of Marine Sciences, Morehead City. His research includes; microbially-mediated nutrient cycling and primary production dynamics of aquatic ecosystems, environmental controls of harmful algal blooms, and assessing the causes and consequences of man-made and climatic (storms, floods) nutrient enrichment and hydrologic alterations of inland, estuarine and coastal waters. His studies have identified the importance and ecological impacts of atmospheric nitrogen deposition as a new nitrogen source supporting estuarine and coastal eutrophication. He is involved in the development and application of microbial and biogeochemical indicators of aquatic ecosystem condition and change in response to human and climatic perturbations. He heads up the Neuse River Estuary Modeling and Monitoring Program, ModMon and ferry-based water quality monitoring program, FerryMon, which employs environmental sensors and a various microbial indicators to assess near real-time ecological condition of the Pamlico Sound System, the USAs second largest estuarine complex. 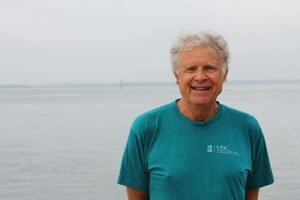 He received the 2003 G. Evelyn Hutchinson Award from the Association of the Sciences of Limnology and Oceanography, and the 2011 Odum Award from the Coastal and Estuarine Research Federation for addressing the causes, consequences and controls of eutrophication in aquatic ecosystems. In December, 2015, he was recognized as a Fellow of the American Geophysical Union. ▪ Determining, sources and roles of nutrients in eutrophication, algal bloom and food web dynamics of the Neuse River and New River Estuaries, Pamlico Sound and nearshore waters. ▪ Determining nutrient over-enrichment and developing nutrient management strategies to control eutrophication and harmful algal blooms in large lake and estuarine ecosystems in the US, China (Lake Taihu), Europe (e.g. Baltic Sea) and other regions. ▪ Evaluating the interactive impacts and roles of human (nutrient) and climatic (storms, hurricanes, floods, droughts) perturbations on estuarine and coastal water quality and habitat condition. ▪ Examining impacts of atmospheric nitrogen deposition on phytoplankton dynamics and eutrophication. ▪ Determining environmental factors controlling blue-green algal (cyanobacterial) nitrogen fixation and bloom dynamics in lakes, rivers, estuarine and coastal ecosystems. Other projects include the formation, function and microbiology of modern day stromatolites; the physical-chemical dynamics of cyanobacterial blooms in the Baltic Sea; and Antarctic lake ice microbial consortia. Dr. Paerl’s research is funded by NSF, NOAA, Sea Grant, EPA, USDA, North Carolina Dept. of Environment and Natural Resources, the NC Water Resources Research Institute, and the Department of Defense (Strategic Environmental Research Program). He heads the Institute of Marine Sciences’ Microbial Ecology/Nutrient Cycling Laboratory and holds a joint appointment in the Departments of Marine Science and Environmental Sciences and Engineering, and Dept. of Biology/Ecology Curriculum.